Philly’s still stuck in traffic. Here are 5 fixes from around the world. Cities around the world have figured out how to ease congestion. Here are five fixes for Philly. 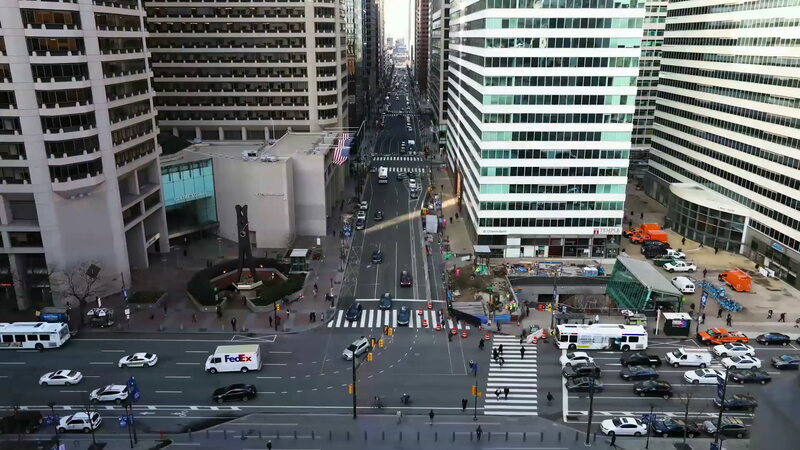 Just try traveling in a straight line for any distance in Center City Philadelphia. Moving, by any means, requires navigating around myriad obstacles: jaywalkers, construction fencing, an illegally parked delivery truck. Sometimes, all these things at once. 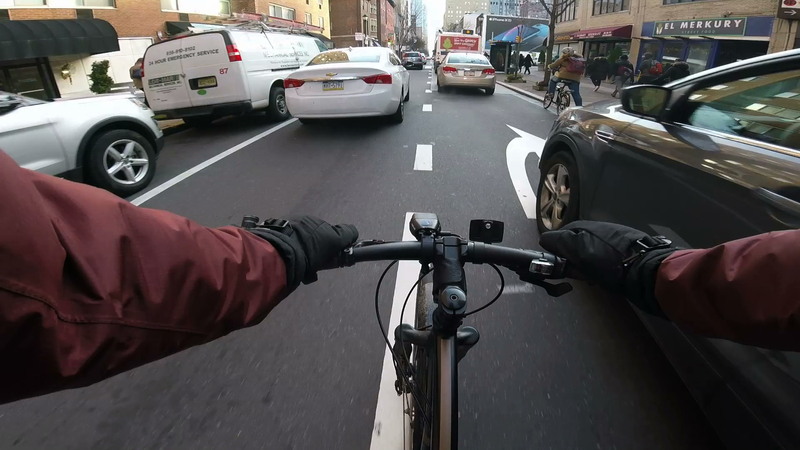 The Inquirer dispatched a team of reporters, photographers, and videographers in December to bike, bus, walk, and drive along Chestnut and 15th Streets, two of Center City’s busiest thruways. One reporter tagged along on a UPS delivery route. Each had a different perspective on what caused the most frustration, with fingers justly pointed at every kind of traveler. People on foot bemoaned construction crews, a driver complained about careless pedestrians, and a bus passenger noticed how cars' sloppy parking seriously hindered public transit. More people, more construction, more drivers, and more businesses all contribute to the morass. Center City added 16,558 jobs from 2008 to 2017 in a place where almost 60 percent of workers commute by car. 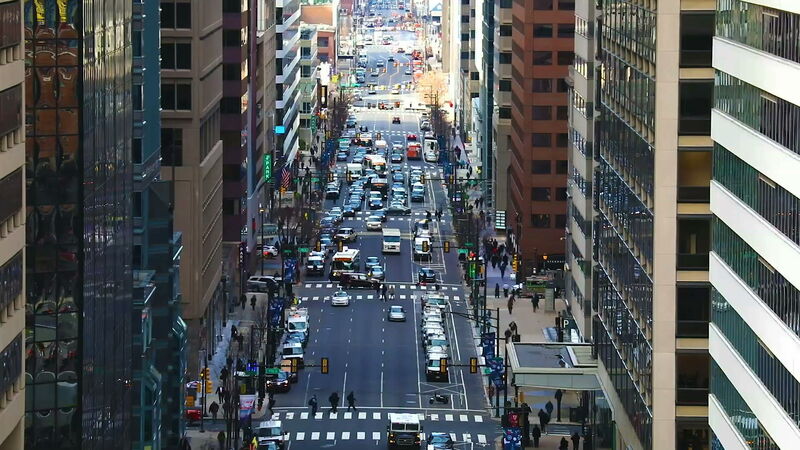 Nearly 7,000 vehicles a day travel Chestnut Street east of Broad Street, up 17 percent since 2011, according to the Delaware Valley Regional Planning Commission. The proliferation of Uber and Lyfts in the city has added to the number of cars on the road, and drawn riders away from public transportation. And our online-shopping-addicted culture leads to an estimated 18,000 deliveries a day in Center City. Since 2007, Philadelphians are spending more hours hung up in traffic, a 2015 study from the Texas A&M Transportation Institute found. 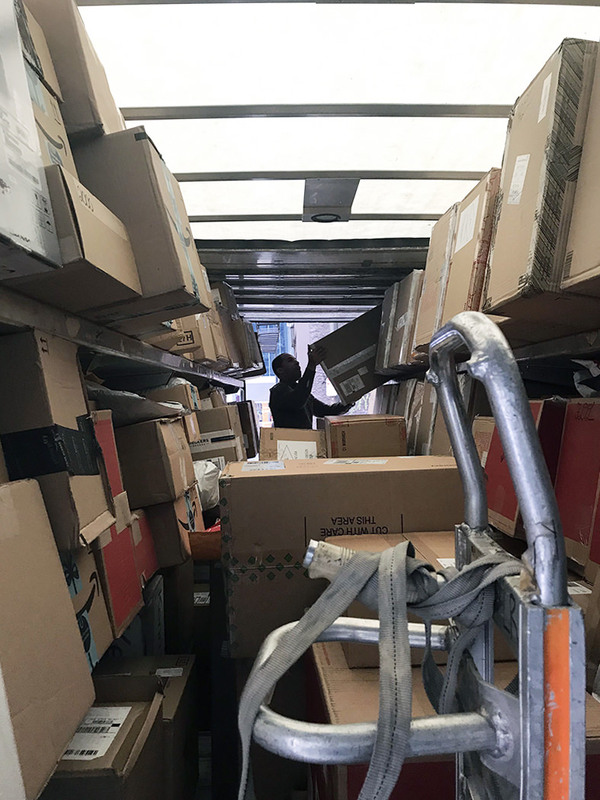 Eli Salim unloads cargo from his UPS truck in Center City. Many big cities are facing the same pressures, so we reached out to planners, city officials, and transit experts worldwide to explore what they are doing to manage congestion. Philadelphia is only now experimenting with ideas that are commonplace elsewhere. In part, that’s because traffic here still isn’t as bad as in other places. (Philadelphia as a whole ranks 16th worst among major American cities in hours spent in traffic each year.) But if the population and employment continue to increase as projected, traffic will only worsen, to the detriment of the city’s livability and economy. 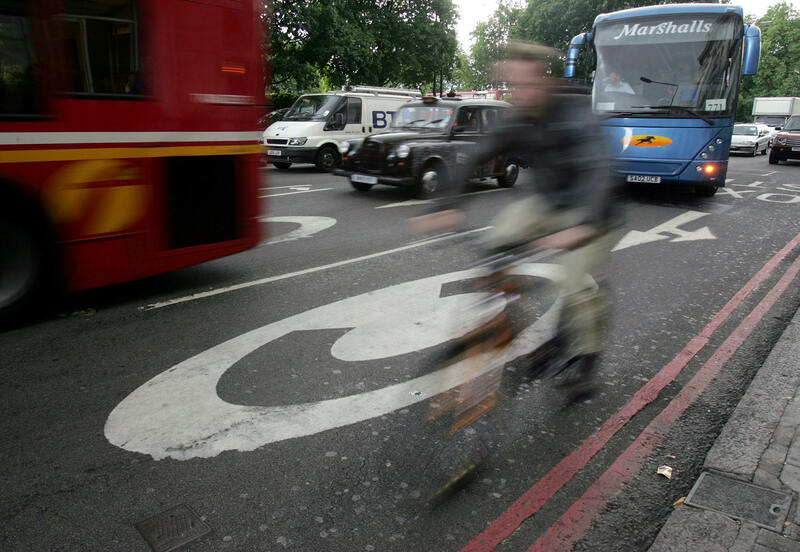 London reduced the number of car commuters by establishing a congestion tax. Copenhagen, Denmark, and Cambridge, Mass., redesigned streets so vehicles, bikes, and pedestrians can safely share the road. Paris took big delivery trucks off the streets by encouraging warehouse development where the trucks could off-load packages to smaller vehicles, including cargo bikes. New York City sped up buses by dedicating lanes and streamlining ticketing and loading on thoroughfares like 34th Street. Washington D.C. keeps pedestrians safer through strict rules that reduce sidewalk closures near construction sites. 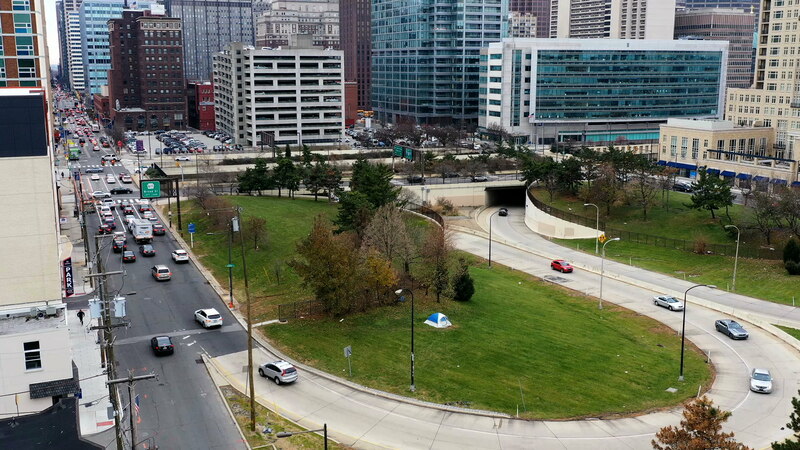 Some solutions are natural fits for Philadelphia, while others may be harder to adapt. Some would require major financial investments, while others would task city government with shifting policy in a big way. None of the solutions is a silver bullet, and some examples show how successful policy can falter without maintenance and modernization. Still, it’s clear Philadelphia hasn’t engaged with congestion as aggressively as other cities. The roads ringing City Hall are jammed nearly every morning as car commuters exit I-676, transit riders emerge from buses and subway tunnels, and impatient pedestrians jaywalk. “You really can’t stop car congestion, except for one tool, which is congestion pricing,” said Jeff Speck, a Massachusetts-based city planner who has written about street management. Philadelphia is the 16th worst U.S. city for hours spent in traffic annually. Congestion pricing is a fee charged to vehicles traveling into or within a predetermined area of a city at certain hours of certain days. The goal is to discourage people from driving into a city’s busiest areas and turn to public transit instead. London established an 8.1-square-mile congestion-pricing zone almost 16 years ago, enforced by nearly 200 cameras. The fee is £11.50 daily from 7 a.m. to 6 p.m. on weekdays, the equivalent of more than $15. Drivers can pay in advance of entering the zone or the day after for an additional £2.50, or about $3.30. Drivers who must use their cars in the zone daily can set up an automatic payment at a slightly less expensive rate. $15 fee charged from 7 a.m. to 6 p.m. weekdays. Congestion zone enforced by nearly 200 cameras. Traffic thinned, public transit use grew, and delays dropped by 30 percent in the first three years of the program, according to the British think tank Centre for Cities, though reports from the city note congestion has been increasing again despite the fee. The £1.9 billion in net revenue (about $2.5 billion) raised through 2017 was used for bus-network improvements, bridge repairs, and other needs, according to a 2017 report from Transport for London. London tried to expand the zone, but public criticism forced the city to scale it back in 2010. The city resolved another major criticism of its program last year when it approved an end to the exemption for ride-share vehicles that will go into effect in April. Traffic goes past 'C' signs on the road marking entry into the central London Congestion Charging zone at London's Marble Arch. Philadelphia’s traffic woes may not yet warrant this significant a solution, said Barry Seymour, executive director of the DVRPC. If Philadelphia wanted to explore congestion pricing, it would need state approval, and lawmakers could resist what amounts to a new tax. Some commuters, particularly suburbanites, may not have many alternatives to driving. Also, the fees would “need to be set up just right so that they’re benefiting low-income people and not hurting them,” said Chris Puchalsky, OTIS’s director of policy and strategic initiatives. What should Philly fix? Send us your photos, videos, and stories of congestion nightmares. Philadelphia’s first taste of congestion pricing might come in the form of an added fee for Uber and Lyft vehicles operating in the city’s busiest areas at certain times, Puchalsky said — something New York City is already doing. 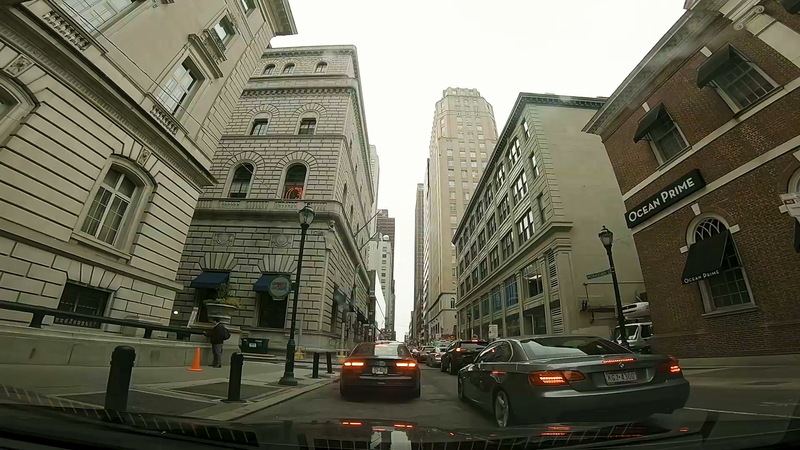 Riding a bicycle through Center City shows that cars rule Philadelphia’s roads. Chestnut and 15th don’t have bike lanes in Center City, and on 13th Street, which does, the lane is often filled with obstacles like delivery trucks and construction. Philadelphia planners hope to reclaim street space from cars for other users, according to a seven-year transportation plan released in October. Many city streets would require engineering and design changes. Copenhagen’s redesigned streets have become a world model. The Danish city’s 40-year shift away from a car culture was driven by concerns about urban flight, oil prices, and climate change, said Shin-pei Tsay, executive director of the Gehl Institute in New York City, a nonprofit with connections to the Copenhagen urban designer and architect Jan Gehl. More than 200 miles of bike routes, including streets where pedestrians, cyclists, and cars operate at different grades. But it was protected bike lanes that really pushed people out of their cars. Cyclists essentially have their own sidewalk a little higher than the pavement that cars drive on but lower than pedestrian walkways. On more than 200 miles of bike routes, including streets where pedestrians, cyclists, and cars operate at different grades. Copenhagen eliminated parking on these streets and on smaller roads, too, moving it to underground lots, or the outskirts of the city. The city of 600,000 even has separate bicycle highways. 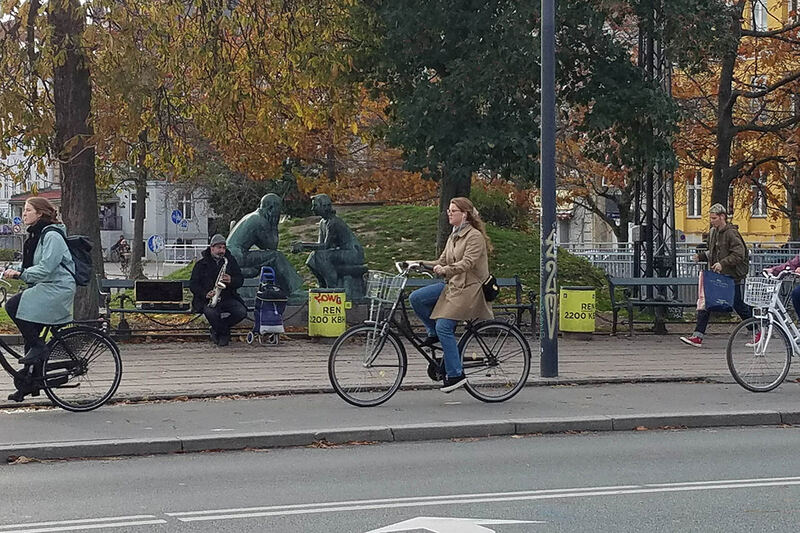 Almost half of Copenhagen’s workers and students commute by bicycle, compared with about two percent in Philadelphia. A street in Copenhagen with the tiered structure that creates physical barriers to separate drivers from cyclists and pedestrians. Similar street designs are filtering into the United States. In Cambridge, Mass., the Department of Public Works has for the last decade pursued an ambitious plan to redesign its 125 miles of roads on the same principles Copenhagen used. 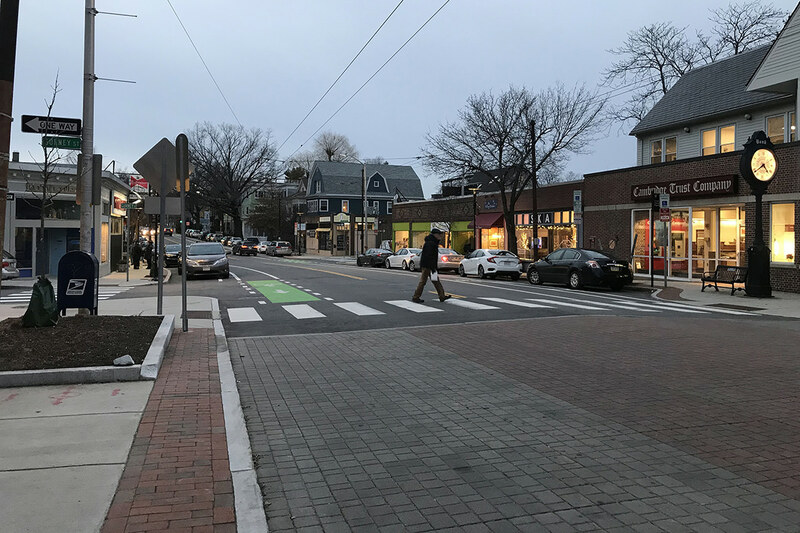 Cambridge devotes up to $6 million for coordinated right of way improvements that can upgrade bike lanes, sidewalks, bus stops, and roadways. If needed, utility work is timed to coincide. Redesigning 125 miles of roads, spending $6 million annually to update six to seven streets with bike infrastructure, utility maintenance, sidewalk improvements, and repaving. Philadelphia, which has 2,575 miles of streets, is not yet at Cambridge’s level of coordination, though three years ago it introduced software to track utility projects to encourage them to coincide with streets projects. As the poorest of America’s ten most populous cities, Philadelphia also contends with the high cost of infrastructure redesigns. A curb-ramp upgrade at one corner can cost $25,000 and a traffic-signal upgrade can range from $230,000 to more than $1 million. The city began 10 public works projects in 2018, valued at about $77 million. The projects include the progressive — raised crosswalks on Broad Street for $780,000 — and the mundane — $10 million for paving and curb ramps. Paving projects now are planned with the city’s safer streets program in mind, so bike lanes and striping changes are considered. The intersection of Huron Avenue and Chilton Street highlights some of the changes Cambridge Mass. is making to its streets. Features like curb bumpouts at intersections and brightly painted bike lanes are designed to contribute to safer streets. An additional complication in Philadelphia is City Council’s great influence over any street changes that shift curbside parking, something that has slowed the city’s installation of bike lanes. One of Philadelphia’s most recent experiments with bike lanes, though, shows that changing the roadway can alter how people drive. A pilot program that replaced driving lanes with protected bike lanes on Market Street and JFK Boulevard resulted in a 20 percent increase in cycling, said Kelley Yemen, the city’s complete streets director, and cars' speeds decreased by 30 percent. Reducing lanes, though, hasn’t slowed people’s overall travel time. How Much Road do Fifty Commuters Need? Personal vehicles take up the vast majority of space on city streets, since 60 percent of Philadelphia workers commute by car. 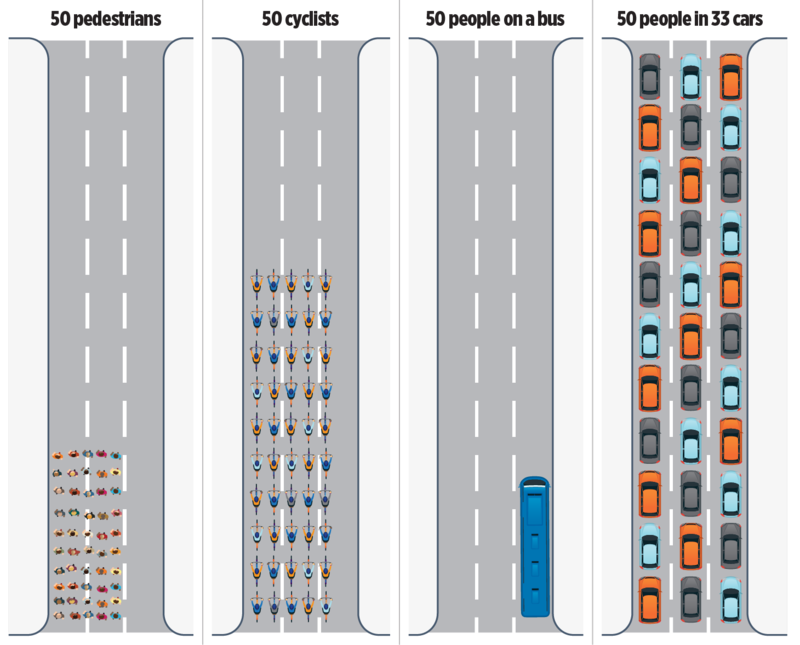 A comparison of the space requirements for different commuting choices reveals that cars take up significantly more room per person than buses or bicycles. Salim, 44, a driver for more than two decades, prides himself on his ability to dodge traffic traps. There are an estimated 18,000 deliveries a day in Center City. 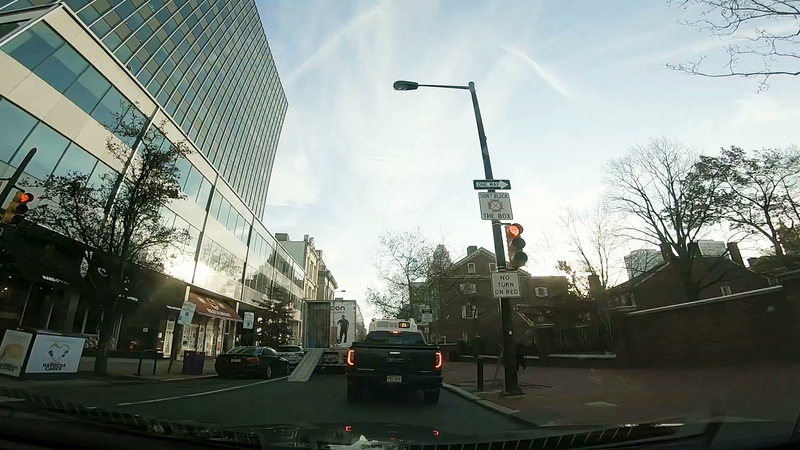 Salim pulled into a drop-off passenger zone at the Academy House on Locust Street. A Philadelphia Parking Authority enforcement worker stopped, chatted about the chilly weather, then stuck a parking violation on the truck’s door. “At least we didn’t block a lane,” Salim said. With 20 logistics developments in the zoned areas, congestion declined by about 10 percent. The ticket isn’t his to pay. UPS will cover it. Delivery companies paid $4.6 million in parking fines from April to September 2018. The PPA wants to increase fines, but experts doubt that will be a deterrent. The time saved by not circling blocks to find legal parking is more valuable to delivery companies than avoiding tickets. Paris, a city of more than two million, used zoning in 2016 to direct development of distribution and logistics warehouses along the waterfront or near train tracks close to the city center. These create space where deliveries can be broken down and reloaded onto smaller vehicles less likely to clog travel lanes, such as cargo bikes. The bikes — partially powered by electric motors and able to carry up to 500 pounds as far as two miles — were once a laughable idea; now they’re taken seriously. 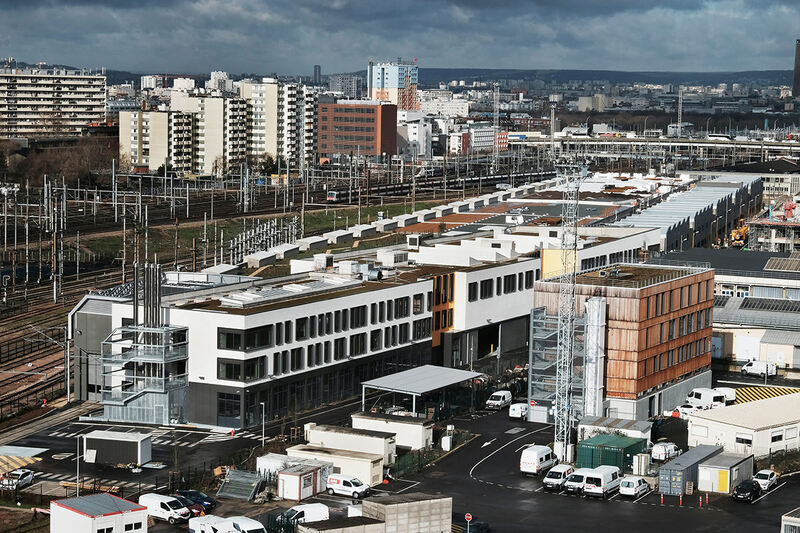 Chappelle International, a logistics center in north Paris, includes a rail freight station, offices, restaurant, sport facilities, data center. Paris now has about 20 freight logistics developments in the zoned areas, said Laetitia Dablanc, a professor of logistics at the University of Paris and director of research at the French Institute of Science and Technology. They have reduced congestion by almost 10 percent, but the demand for deliveries still exceeds the supply. “I guess they would need 80 of them to really run operations with electric vans or walking or cargo cycles,” she said. 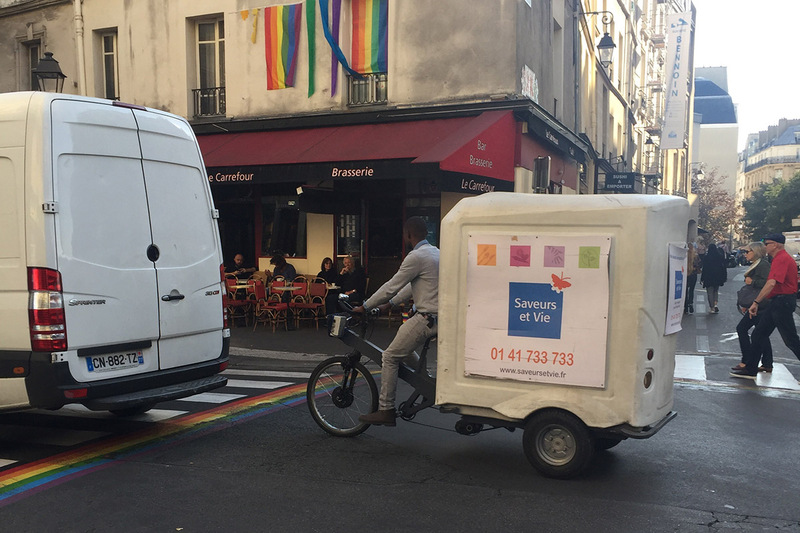 Cargo bikes like this one traveling on a Paris street, could be one way to cut back on delivery trucks in dense city centers. Warehouses are being developed in Philadelphia, though without an assist from zoning. The city hopes to have better-planned loading zones, which now are created through individual requests from businesses. In the coming year, though, changes will likely be limited to tweaking the time limits for curbside parking and shifting spaces from private vehicle parking to loading spaces, mostly in Center City. New York City has a voluntary night-delivery pilot program with 300 participating businesses and a goal of attracting 900 more. Philadelphia is interested in the concept, but it could require noise-ordinance changes from City Council and won’t come anytime soon. Public transit helps thin congestion by getting people out of cars, and buses are the most flexible, wide-ranging network SEPTA offers. In practice, though, a person on foot is faster than buses in parts of Center City. A car parallel-parking or a double-parked delivery truck can halt a bus. And pulling away from a bus stop back into traffic? Arduous. 65% of SEPTA's 83 bus routes regularly run late. Sixty-five percent of Philadelphia’s 83 bus routes run late. SEPTA and city officials are redesigning Philadelphia’s bus network and considering options like all-door boarding or eliminating transfer fees to speed service. SEPTA expects to start looking for a contractor for the redesign in 2019, but changes could take two to three years to arrive. What Philadelphia talks about, the Big Apple does — and more. On multilane arterials like 34th Street in Manhattan, New York City has dedicated a lane in each direction almost entirely to bus service. Cars can use the lanes for right turns, but otherwise driving in them risks a $150 fine. Driving in a bus lane is a $150 fines. Sixteen rapid bus routes citywide. On these Select Bus Service routes, riders buy tickets from kiosks at stops and board at any door. Random ticket checks keep riders honest. At some stops, curbs are extended to allow buses to stay in the travel lane. Traffic signals detect buses, so lights stay green longer, or switch from red faster, to keep buses moving. “It took the bus from being equivalent to walking, like you may as well just walk, to being something that actually provides a worthwhile service,” said Eric Beaton, deputy commissioner in New York City’s Department of Transportation. Buses on the two-mile route, begun in 2011, were 15 to 20 percent faster than before the dedicated lanes, Beaton said, and ridership on those routes generally grew. The 34th Street route costs $27 million, with curb extensions as the costliest upgrade. The city had been converting about two routes a year to rapid transit service, Beaton said, and now has 16 such routes citywide. This effort, though, has not spared New York City from bus service woes. Plans to grow the Select Bus Service were suspended last year to save money. Ridership is dropping, according to a report issued last year by the city’s Bus Turnaround Coalition. The coalition sees more dedicated bus lanes as part of the solution, as well as better policing of private vehicles in bus lanes, including enforcement with cameras. The dedicated bus lane at 3rd Avenue and 34th Street in Manhattan sets buses apart from city traffic. The stops feature ticket dispensers and buses board passengers through all their doors. Philadelphia has dedicated bus and bike lanes on Chestnut and Market Streets, but without New York’s infrastructure changes and, until recently, little enforcement. Even with just improved midday enforcement, though, SEPTA reported early indications that buses are traveling about three minutes faster on Chestnut. 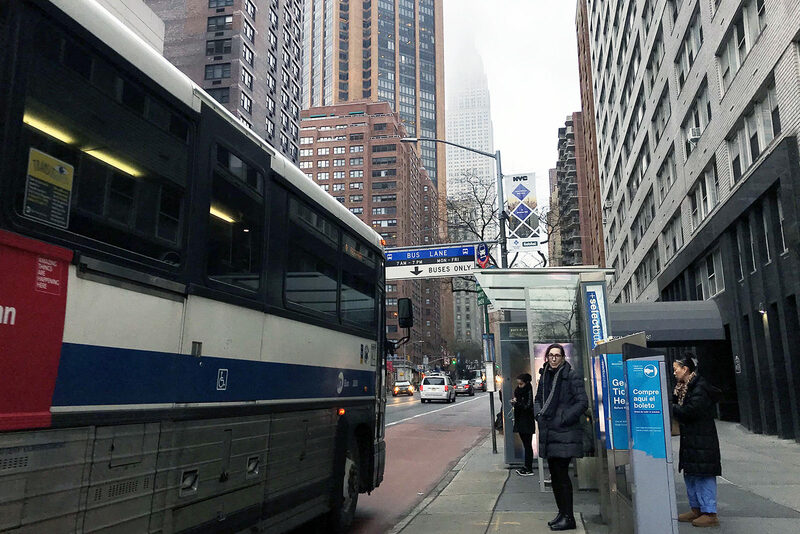 New bus shelters are slated for that street, said Puchalsky, OTIS’s director of policy and strategic initiatives, but further changes will likely wait until the city sets investment priorities to encourage people to ride transit. SEPTA also is exploring which routes would be candidates for dedicated lanes, such as passing lanes, high ridership, limited stops, and dense development. Dedicated bus lanes may come more quickly to Roosevelt Boulevard, where an express bus introduced in 2017 is expected to be upgraded before 2025, said Jennifer Dougherty, SEPTA’s manager of long-range planning. New York is “just farther ahead of us in the process,” Puchalsky said. Work sites spilling into streets and sidewalks force Center City pedestrians to jump, duck, and dodge like heroes in a video game. Philadelphia has almost 2,000 active construction permits, with hundreds more awaiting approval — a welcome sign of the city’s prosperity. But the barricades and fences that surround them bully pedestrians off sidewalks and present a dangerous barrier to travel for people with disabilities or with children in strollers. Philadelphia has almost 2,000 active construction permits. 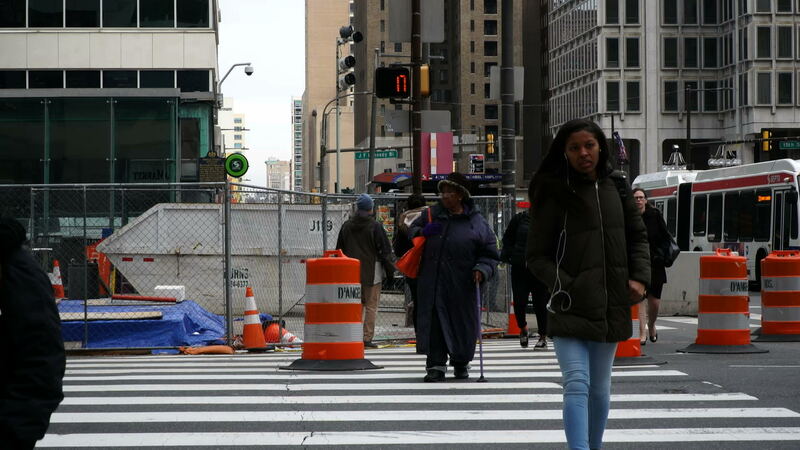 The permitting that allows construction sites to encroach on sidewalks can be confusing, said representatives from Feet First Philly, a pedestrian advocacy group sponsored by the Clear Air Council, and little attention is paid to expiration dates. 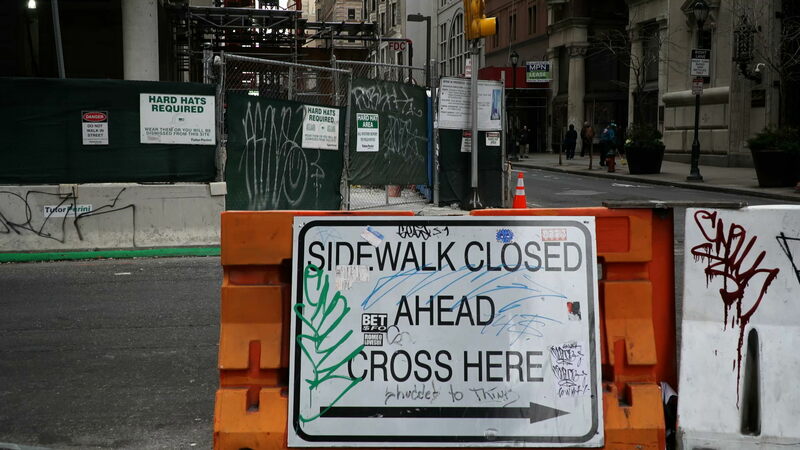 Since 2012, sidewalk closure fees are reduced if builders are able to allow pedestrians to pass on the same side of the street, and voided if they keep the sidewalk open. Weekly diversion fees — the mayor has suggested a daily fee — increase along with the extent of the disruption. Philadelphia’s challenge, though, is enforcement. The city has just six inspectors and two supervisors dedicated to right-of-way enforcement. Compare that with another city with a construction boom, Washington, which has 24 inspectors assigned to that task. Beyond compliance, Philadelphia’s right-of-way unit also is responsible for issuing permits and reviewing building plans. The city’s fears about noncompliance were borne out in December, when a developer and contractor agreed to pay $160,000 for failing to obtain proper permits or creating fraudulent documents for years. Washington considers closing sidewalks unnecessary for most stages of a project. Washington D.C. has 24 right-of-way inspectors; Philadelphia has six. “Detours should be only done when absolutely necessary, and there’s no other way to manage traffic,” said Matthew Marcou, associate director of the public space regulation division in the district’s Department of Transportation. Working with builders, that city established preferred options, including maintaining an open portion of sidewalk, covered walkways, diverting pedestrians into parking lanes, or diverting pedestrians into vehicle lanes. A similar set of options aims to keep bike lanes intact during construction. Closing a sidewalk is reserved for phases like demolition. Philadelphia is looking at mapping permits to ensure both sides of a street aren’t obstructed and has started allowing online applications for permits, which should streamline the system. Hiring isn’t likely, officials said, but there are discussions about reassigning some of the city’s 56 public works inspectors. “Additional resources would definitely help," said Pat O’Donnell, Philadelphia’s director of operations for transportation. The city wants to better coordinate traffic signals, but traffic lights run on more than 60-year-old technology. It envisions better street design but already has a 1,000-mile backlog on repaving. Pedestrians could cross more safely in raised crosswalks, but the city goal is to add them to “at least” two intersections by 2020. Philadelphia had 101 traffic-related deaths in 2018 — the highest number since 2012, according to preliminary police data. The picture isn’t entirely dire: Philadelphia has the largest percentage of bike commuters of any large American city, and transit use is third highest. People’s choices about how to shop, how to travel, and where to live can either contribute to a more navigable city or further clog streets, said William Eisele, a senior researcher with the Texas A&M Transportation Institute. Addressing congestion isn’t just a matter of reallocating travel lanes or making bus service faster. Solutions need to work together and require political will and long-term commitment. Comparisons among cities are difficult, but some indicators show how far Philadelphia has to go. The city paves about half as many miles each year as New York and Denver. Philadelphia's standard for pothole repairs is less stringent than in New York City, Baltimore, Boston, and Denver. Among eight American cities with full-service transportation departments, Philadelphia’s staff has the second fewest workers per lane mile. New York City, Seattle, and Denver have more than twice as many workers per mile as Philadelphia. The city’s seven-year transportation plan envisions $150 million in transportation infrastructure investment by 2025 and aims to eliminate traffic deaths by 2030. They’re ambitious goals, Puchalsky said, and will require more annual funding than the city currently dedicates to transportation ($97 million from city budget, almost $87 million in grants). Still to come are the city’s plan to encourage transit use and SEPTA’s bus network redesign. Those, too, will set the table for the city’s priorities. One advantage to being behind the curve? There are plenty of trailblazers to learn from. 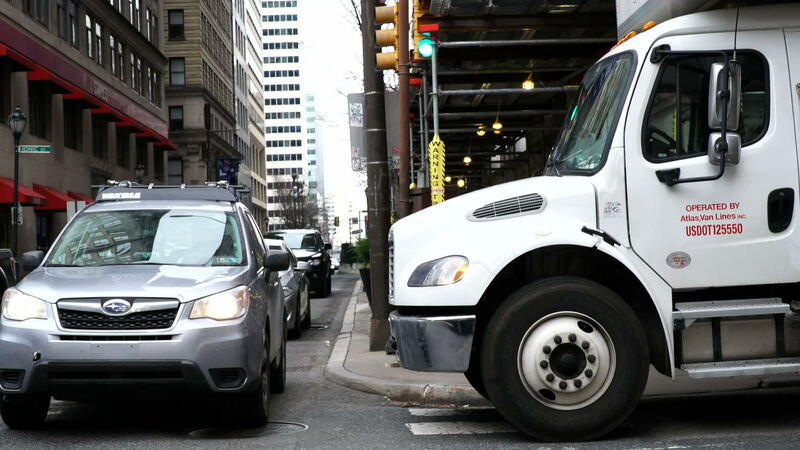 Truck traffic is clogging Center City streets. What’s Philly going to do about it? Trouble viewing? Click here to view this Special Project in full.